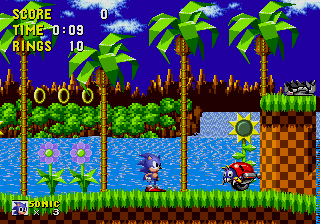 Spindash Into Our Sega Quiz! How much do you know about the iconic gaming company behind Sonic the Hedgehog and countless others? For the younger members of our audience: Sega, while currently one of the major publishers in the industry, used to be one of the big dogs of hardware. In the early-to-mid 1990s, Sega was Nintendo's primary rival in the videogame market before Sony entered the ring and changed the game for good. Sega's final console was the Dreamcast - and after that, they made the switch to simply making videogames, rather than making the consoles on which they were played. But Sega still has a place in the heart of many a gamer. This week's issue of The Escapist magazine is devoted to all things Sega, so we thought that we'd celebrate it with a quiz! This one goes out to all the people who still hear the classic "Seeeee-ga!" in their mind whenever they see that blue logo. If you think you've got what it takes (including a knowledge of some more obscure Sega games), try your hand at the quiz! As always, you can take it as many times as you want in search of a perfect score, but it will be reflected on our leaderboards if you aren't the fastest thing alive.